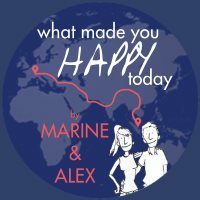 Islamabad – December 11th to 15th 2016 – What Made You Happy Today? 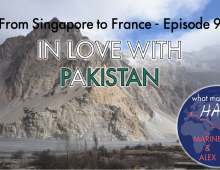 Islamabad… I have to admit the name of this city inspired a feeling of apprehension in my mind, and I did not know why… And after leaving our friend Tajammul and the peaceful life in Gilgit, our trip to Islamabad happened to be quite tiring. First, even if Islamabad is only about 600 km away from Gilgit, the trip takes 16 hours! And even if it goes along the Karakoram Highway, the road is in very bad condition, bumpy as hell. Then we had to go through several police checkpoints where only Alex and I would get off the bus to be interrogated by the police on the purpose of our trip. Actually, in the bus there was a guard at the front with a bullet proof vest and a gun and he was the one going with us to the checkpoint office. After two checkpoints, he realized we had several copies of our passports so he took them and said that for the next checkpoints he could go without us and give the copies to the police. 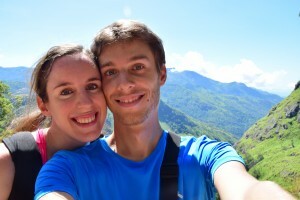 Thanks to his help, we spent the rest of the trip not worrying about every stop. At 8pm, after 10 hours driving, we made a stop at PTCD Motel (motels managed by a governmental tourism organisation) and we thought it was the night stop so that we could sleep and go back on the bus the next day. One man told us that this was time for the dinner, offered by the bus company, and that we would get back in the bus after 30 minutes. When we asked about sleeping, he told us that the bus was not stopping for the night and that we would arrive in Islamabad at 3am!!! What a surprise! Usually buses stop for the night but some, like the one we were in, do not! Too bad, we expected to finally get some rest after a day jumping on our seats, but we would spend a night in the bus. And when we arrived at 3am, Islamabad was there, full of unfriendly atmosphere, or was it in my mind? The bus dropped us in Rawalpindi in the South of Islamabad in a kind of bazaar where taxi drivers started to harass us and where hotels offered rooms with no shower, even shared (and we really needed one!). We searched on the internet and found a guesthouse in Islamabad. Hopefully a driver accepted to drive us there in the middle of the night for a reasonable price. We crossed several police checkpoints and drove through a ghost city, but which looked more modern than what we expected. The driver left us in a residential area with comfortable houses where our guesthouse appeared to be a beautiful and modern house with hot shower and a clean room, all that we needed! At night, we met with our host Faysal who directly brought us to an Afghan restaurant where we had delicious kebabs. Then he brought us to have some drinks in Margalla Hills, beautiful hills overlooking the city. Faysal lives in Rawalpindi which is actually the twin sister of Islamabad, just South to it, and an older city. Islamabad is very modern because it has been built from nothing in the 1960s when the location was selected to be the place of the new capital, replacing Karachi. Islamabad is built on a grid pattern, where each neighborhood is a perfect square and has at its centre a public area surrounded by shops and restaurants. There is one square called the Minister’s enclave, dedicated to government departments, and one called the Diplomatic enclave which is for all the embassies and the houses of diplomats (and to enter in this neighborhood you need a special authorization). On the contrary, Rawalpindi is dense and more lively with its popular bazaar. It is also where the headquarters of the Pakistani army and the airport are located. Our second day in Islamabad was holy day because of the celebration of the birth of the Prophet Mohammed (Mawlid). So Faysal brought us in the centre of Rawalpindi to see the processions of people who were gathering in different parts of the city to pray and sing. We arrived in the middle of a public place where hundreds of people had gathered in front of a big stage. At this moment, I remembered reading on the French government website that tourists should avoid gatherings in Pakistan… but anyway we were already there. There were a few men sitting on the stage, and another man with a microphone was singing and leading the crowd. Faysal asked me if I wanted to go up on the stage to take a picture so we went up there, and when we turned around to face the crowd, I saw the leader pointing at us as he spoke to the crowd. We were asked to come at the front of the stage. The leader talked to the crowd in what looked like a welcoming message for us, Faysal said a few words explaining who we were, French tourists visiting and enjoying Pakistan. Two men arrived from nowhere to put garlands around our necks. Then Faysal started to sing a beautiful spiritual song on the stage and they brought him a big golden trophy. Everything was going super fast. A woman suddenly grabbed my hand so hard and gave me a big hug! The crowd and the leader started to sing loudly and moving arms above their heads. The leader approached me with a scarf he waved in his hands and put it as a veil on my head. Faysal told me afterwards that it is a ceremonial of the Prophet who respected women and used to put scarfs on their heads like the leader did with me. After this, we went down the stage and some men set aside the crowd so we get out. People followed us, taking pictures with us. Men shook hands with Alex when women brought the children to take my hand. People offered us food. It was incredible. After all these emotions, we went to Islamabad, where we visited Faisal Mosque, a magnificent huge mosque, beautifully built next to Margalla Hills. Then we went to the big Centaurus mall, a modern mall full of Western boutiques. We also discovered nice places to hang out with friends, and restaurants with terraces to enjoy the nice weather. Faysal also brought us to eat a delicious Chicken Rice (Pakistani style, not Singaporean!) at Savours Food, yummy! The next day’s mission was to sell Faysal’s car. We spent the day going to different places with the buyer to put things in order. Our aim in Islamabad was also to get a visa extension… Indeed we had already consumed half of our stay, and we wanted more of Pakistan! We went to the Ministry of Interior to get a letter that we would then be able to submit to the Passport and visa office in another building 6 km away. We have to say that the Ministry of Interior is full of paperwork and lots of people looking like they do nothing. The best way to sum up the situation of bureaucracy in Pakistan is that we crossed long corridors where the name “Secretary” was declined on all doors. You have the first secretary, the deputy secretary, the chief secretary, the second secretary, the assistant secretary… We had a fun time though. We were offered some tea, we helped one secretary to print a complicated table on Microsoft Word, and we left with the need to come back the day after to collect our letter. The next day we went back to the Ministry, got another tea, got the letter. Then we went to the Passport and visa office, to present our letter and ask for the visa extension. But we needed to pay something to the bank and it was too late in the afternoon so the bank was already closed. Then we figured out we were going back again to the Ministry of Interior. Because Faysal had realized we needed an authorization letter (NOC) to go to the area where the wedding was held, Dera Ismail Khan. Actually, some areas in Pakistan are still restricted for foreigners and they need a special authorization to go there and so that they get protection. 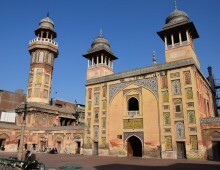 However, geographically speaking, the area of Dera Ismail Khan is still far from Balochistan, the only region in Pakistan which has the reputation to be dangerous. So we were not afraid of going there. But we started to be a little worried that we would not arrive on time at the wedding, eight hours drive away from Islamabad. When we finally left for the wedding it was already very late and we arrived at night when the ceremony was over. 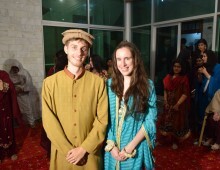 Hopefully, weddings in Pakistan last several days and we missed only the first one!! Merci Caroline pour ton gentil message ! En effet, on découvre tous les jours de nouvelles choses, c’est intense ! J’espère que tout va bien de votre côté ! How lucky you are, blessed by a crowd in ‘Pindi ! Take good care, be humble and learn. This is lessons for life, and the stakes are high. Now I see what made you happy today. You made my day too.